DEVA Nutrition delivers high quality, potency, and affordability in one bottle. 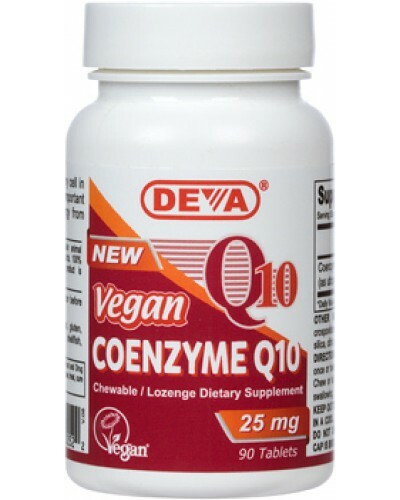 Our 100% Vegan Coenzyme Q10 is in a convenient lozenge form that can dissolve in mouth or can be chewed before swallowing so people who have difficulty swallowing pills can take it easily as well. Coenzyme Q10 (CoQ10) is a naturally occurring fat-soluble co-enzyme with vitamin-like actions, that concentrates in the heart, liver, kidneys, pancreas, skeletal muscles, and thyroid gland.ii CoQ10 has two important functions: production of energy inside the mitochondria, the “powerhouse” of cells, and as a potent free-radical scavenger. 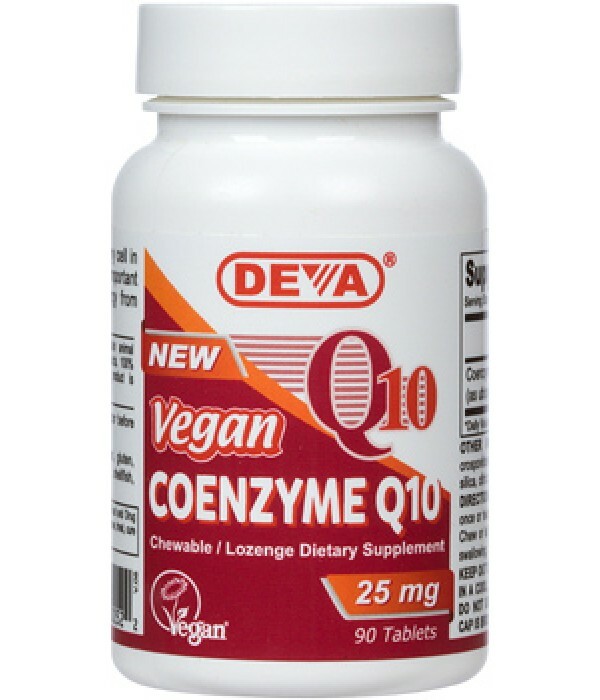 DEVA Coenzyme Q10 is 100% vegan, vegetarian. In order to provide peace-of-mind to our consumers, our products have been registered as 100% Vegan by the non-profit Vegan Society. This non-profit organization, which first coined the phrase “vegan,” has a strict and detailed registration process for vegan products. For adults, take one (1) lozenge tablet one or two times daily with food or as directed by a health care professional. Chew or let lozenge dissolve in mouth before swallowing. Free of yeast, wheat, gluten, soy, sugar, salt, dairy, egg, shell fish; animal products, byproducts or derivatives. ii Zheng A et al. Influence of CoQ10 on autonomic nervous activity and energy metabolism during exercise in healthy subjects. J Nutr Sci Vitaminol (Tokyo). 2008 Aug;54(4):286-90. PMID: 18797149.
viii Puizina-Ivic N. Skin aging. Acta Dermatovenerol Alp Panonica Adriat. 2008 Jun;17(2):47-54. PMID: 18709289.
ix Chaturvedi RK et al. Ann N Y Acad Sci. 2008 Dec;1147:395-412. PMID: 19076459.
x Harinstein ME et al. Am J Ther. 2008 May-Jun;15(3):206-13. PMID: 18496257.
xi Premkumar VG et al. Vascul Pharmacol. 2008 Apr-Jun;48(4-6):191-201. Epub 2008 Mar 5. PMID: 18407793.
xii Stamelou M et al. Mov Disord. 2008 May 15;23(7):942-9. PMID: 18464278.
xiii Coenzyme Q10. Mayo Clinic. Available at:http://www.mayoclinic.com/health/coenzyme-q10/NS_patient-coenzymeq10 Accessed February 21, 2009.